Still, there are aspects of St. Patrick’s Day I can get behind. Mostly Irish Soda Bread, with extra salted butter. Jameson, maybe. But a glassful of cool, minty, blended vanilla ice cream topped with fresh whipped cream and shower of dark chocolate cookie crumbs? If I could have one of those in the name of St. Patrick, whoever he might actually be, then absolutely. Let’s Paddy it up. A toast to St. Patrick! Happy day of milkshakes him. I know that real Shamrock Shakes use sweetened whipped cream and omit the cookie crumbs, but why would you want sweet on sweet on sweet with that cream? And no cookie crumbs? What’s good about that? In the matter of no cookies versus cookies, I think we all know the right choice. Also, I prefer my shakes to be only gently minty, so I go for only 1/4 teaspoon peppermint extract. If you’re bigger into the mint, don’t be shy about adding a bit more. In a bowl, use a whisk to whip the cream until soft peaks form. Set aside. 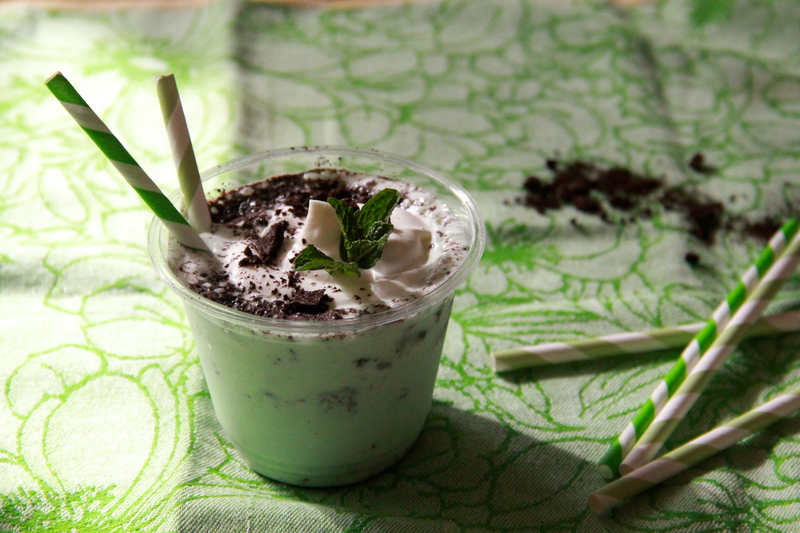 Put ice cream, milk, 1/4 teaspoon peppermint extract and green food coloring (if using) in a blender, and pulse to combine. 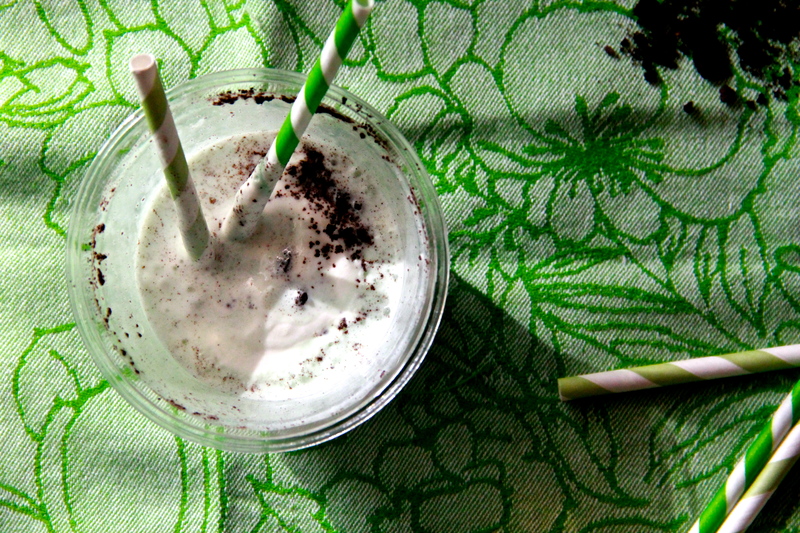 The resulting milkshake should be thick, creamy and light green in color. 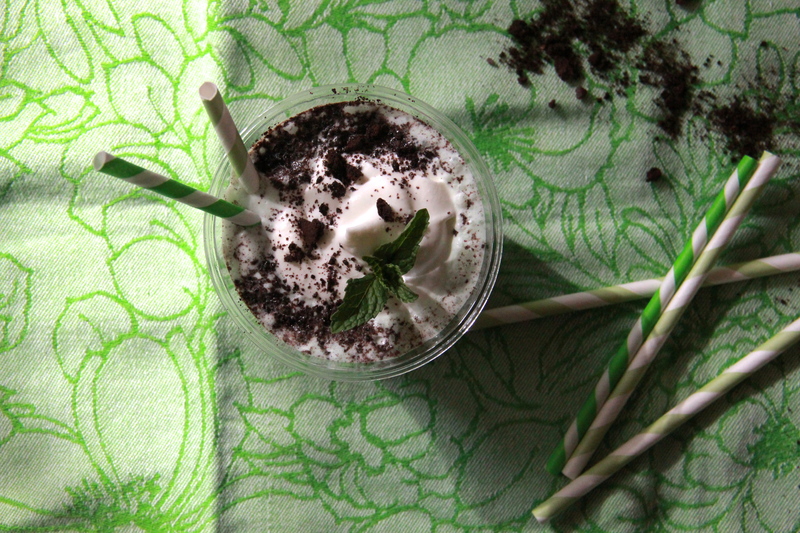 Taste the shake — if it’s not minty enough for you, add more extract and pulse to combine. Sprinkle spoonfuls of cookie crumbs into the bottom of 4 small or 2 larger serving glasses. Pour milkshake on top of cookies. Spoon large dollops of whipped cream on top of milkshake, and finish with another dusting of cookie crumbs.